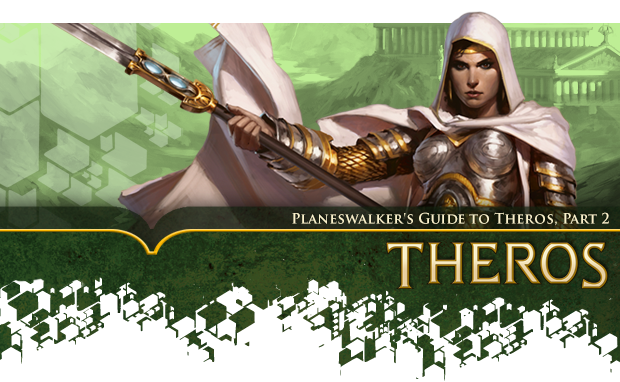 This is the second of three Planeswalker's Guides for the world of Theros and the eponymous first expansion set there. 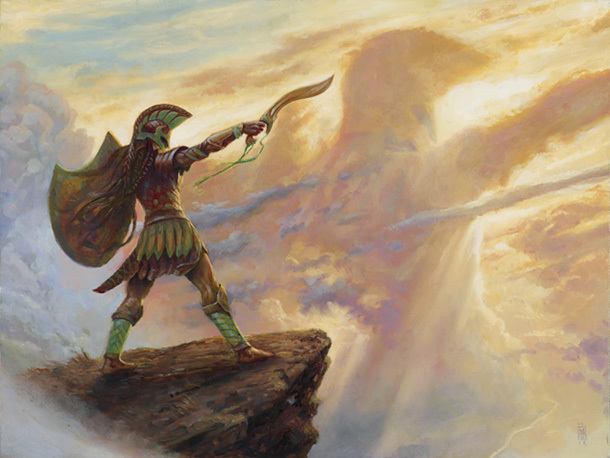 Catch up on the gods of Theros with Part 1. 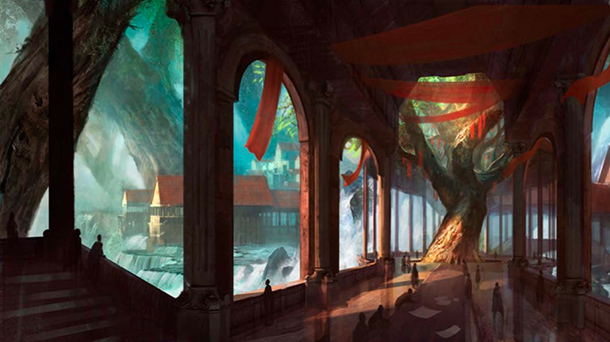 The humans of Theros embody the spirit of carving out a place for civilization from the wilds. 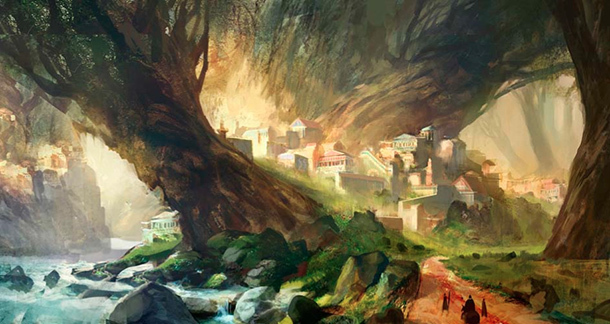 Although other, smaller settlements exist, the majority of humans are associated with one of Theros's three major poleis: Meletis, Akros, and Setessa. Meletis is the polis of learning, magic, and progress. It is a city-state of progressive thinkers, pious thaumaturges, and wise oracles. Meletis was born from the defeat of tyranny, and to this day it retains a spirit of the triumph of free thought over brutish force. Meletians pride themselves on their great temples to the gods, their thaumaturgical academy, their great works of architecture, and for their Reverent Army. Field and river, city and sea. 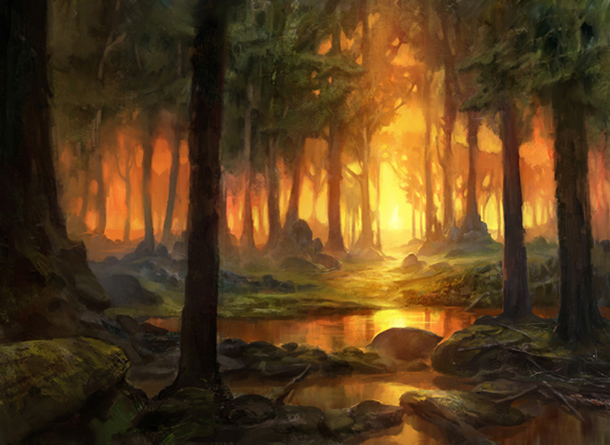 Meletis sits on the coast, surrounded by rivers and vast, stepped grasslands. Fields of a cultivated type of barley called sitra provide sustenance to Meletians and their animals. Branches of the River Kheir splay out across the landscape, bringing fresh water and trade from distant villages. Hub of civilization. 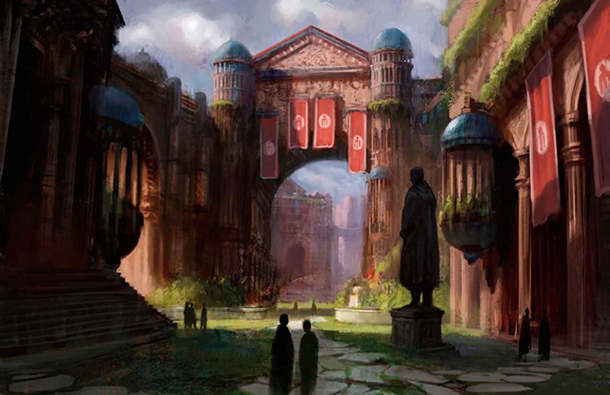 The great temples of Meletis are testaments to the achievements of civilized humanity. Signs of architectural and academic achievement are everywhere. Even the streets of Meletis are formed of bricks of interlocking geometric shapes, demonstrating mathematical and mystical principles. 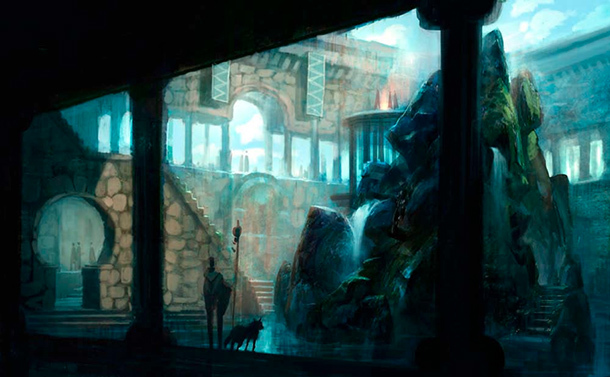 The wildlands of Theros feel distant, almost mythical, from inside the city's bounds. 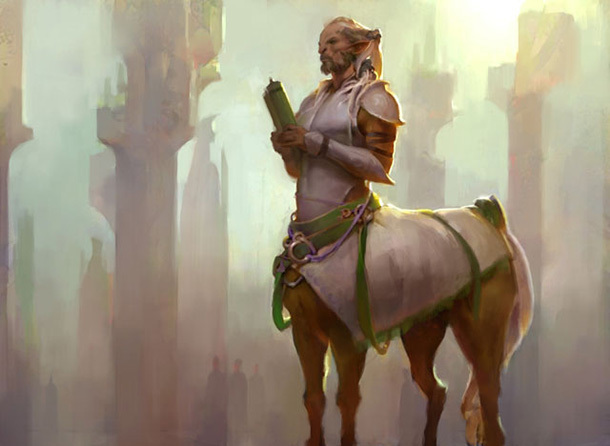 Meletis does suffer attacks from sirens, tritons, and larger monsters, but many citizens of Meletis have never seen in person any monster bigger or more exotic than a centaur. "By Heliod's bright spear." Expresses surprise or wonder. "From the gods' voice to my ears" (or simply "gods' voice"). Used to emphasize that what the speaker says is true—i.e., that the speaker has been told this by the gods themselves. "By the red eye of Mogis." A mild profanity, often used in reaction to tragedy or violent death. "With Erebos" or "At Erebos's side." Another way of saying "deceased" or " in the Underworld." Temples. Almost every street of Meletis bears a temple, from simple, one-room neighborhood shrines to six-story temples held up by phalanxes of marble columns. Every god has a temple in Meletis, and many temples are devoted to multiple gods. Artisans continually improve the temples in Meletis, swapping out broken marble or crumbling sculptures with fresh materials, and painting over grand friezes with even grander ones. 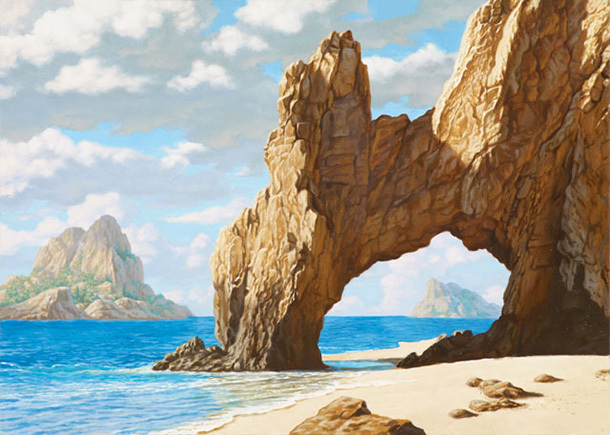 The Dakra, isles of enchantment. Meletis sits on the Siren Sea, surrounded by a host of small islands called the Dakra. The Dakra are said to have been created when Thassa, god of the sea, felt sorrow that Korinna, ancient queen of the tritons, had been killed by a human's harpoon. Thassa's tears fell onto the sea in the form of an archipelago of misty isles. The Dakra have rarely been settled by humans, as they harbor strange nymphs and fierce monsters, and are enchanted with the magic of the gods. Thaumaturges, the mage-elite. Weaving magic is a time-honored tradition in Meletis; magic is seen as one of the greatest arts an artisan can master. The most accomplished mages are known as thaumaturges ("wonder workers"). Many Meletian mages received training at the Dekatia, including many thaumaturges, but one is not truly considered a thaumaturge until one has received a reward or other positive omen from the gods. For example, a mage might be considered a thaumaturge when Heliod, god of the sun, grants her a spear of sunlight, or when she is granted a wild creative vision by Keranos, god of storms. The stonewise. Meletis is a polis of industry and building. Stonewise thaumaturges specialize in magic that erects and restores buildings and other such edifices. Stonewise mages are crucial to the Reverent Army when creating inland military outposts. Philosophers and the Twelve. Meletis is world renowned as the center of philosophical thought. Philosophers have special status here; they are often attended by servants so that they might spend more of their time debating, thinking, and teaching. The Twelve, a council of philosophers, serves as the ruling body of Meletis. The Twelve are currently headed by Perisophia. The Reverent Army. 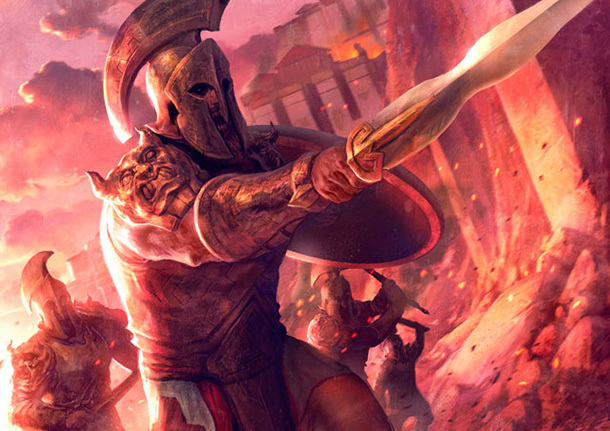 Meletis is defended by the Reverent Army, religiously trained soldiers who fight monsters and exalt the gods. 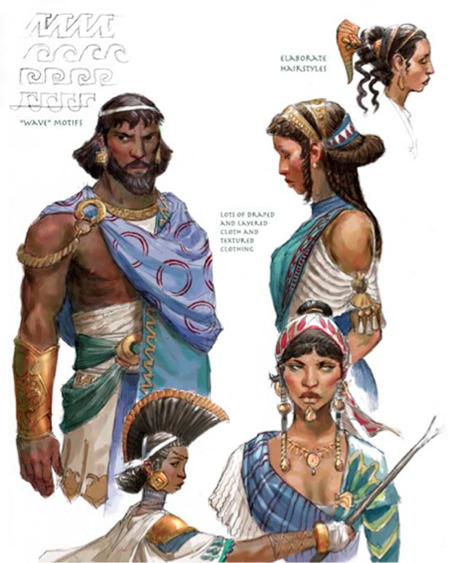 The Meletian Reverents are not as fierce as Akroans nor as sturdy as Setessans, but they are clever and resourceful, and they believe their superior piety for Theros's pantheon leads them to more success in battle. The Battlewise. Meletian soldiers are trained to manipulate the battlefield primarily through tactics rather than through physical strength. 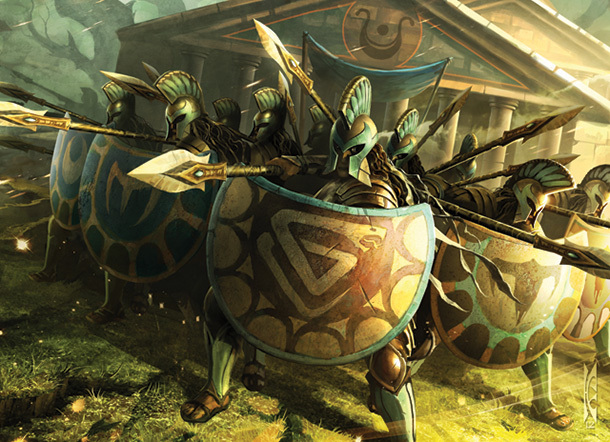 Their hoplites use clever ruses, unusual or rapidly changing troop formations, and even outright deception to score victories. Spell-trained. It's said that every Meletian soldier knows at least one spell. That may be an exaggeration that Meletians allow to circulate, but it is true that many Meletian hoplites could be considered low-level taskmages. Spells of healing, endurance augmentation, and battlefield trickery are often taught during soldier training. Nonhumans in Meletis. Tritons can survive for only a short while on land, yet a few tritons make their home in the coastal city of Meletis. Some serve as lookouts and tower-keepers who watch the shores, warning Meletians of attacks by krakens, archons, or other monsters. Others attend the baths or even instruct students as adjunct philosophers at the Dekatia. Many Pheres Band centaurs are hostile to Meletians, but Meletis officially maintains a fragile peace with the Laggona Band. 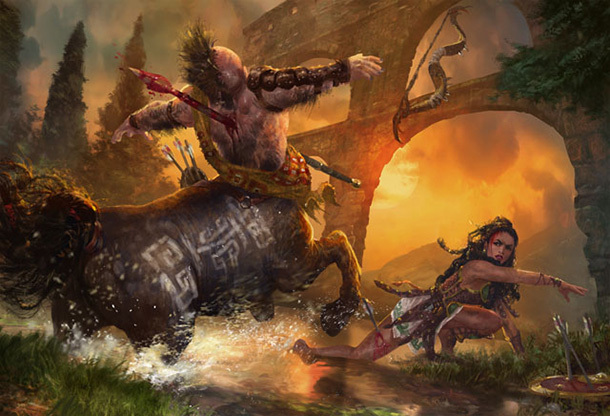 Some smaller centaur tribes have established a profitable trade with the polis. Meletian officials even designate two holidays during the year, making allowances for the overlap with certain centaur celebrations. In accordance with the peace, Meletian outposts generally allow smaller centaur bands to move across their surveyed lands, but some Meletian soldiers aren't happy about it. Medomai, the wandering oracle. The wise and ancient sphinx Medomai is not a consistent resident of Meletis. Instead, he appears a few times a year during moments of historical import, such as religious ceremonies, coronations, and the onset of wars. Medomai has been part of Meletis's history for many decades, seeming to possess cryptic knowledge of future events. His arrival is not necessarily seen as a good omen, as his predictions can be dire. Perisophia, the great philosopher. The most learned living philosopher of Meletis is Perisophia, whose skills at logic, rhetoric, and mind magic are so formidable that she is the match for any debater in any forum. Perisophia currently rules as the most senior member of the Twelve. Hypatia of the Winged Horse. 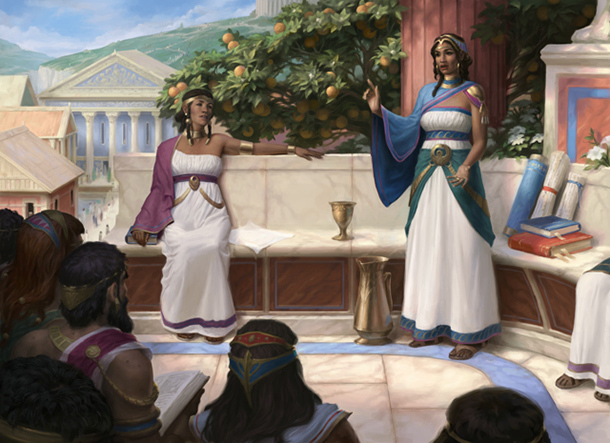 Hypatia was trained as a grange-mage in a Meletian temple to Karametra but found that her calling was on the field of battle. 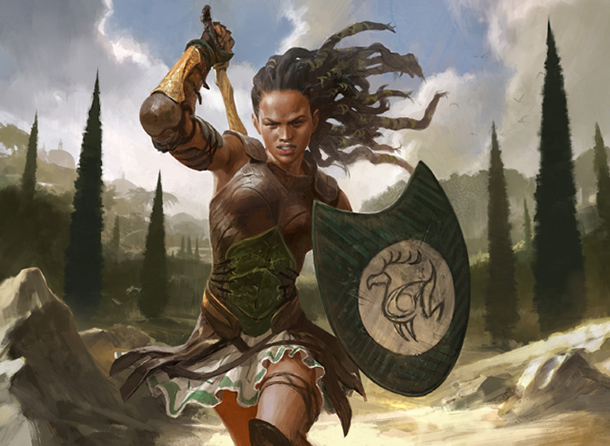 She took up the sword and shield of the Meletian army and showed great promise fighting off threats to the city. During one battle, she was wounded on a high plateau overlooking Meletis. She saw a pegasus herd flying overhead and said a silent prayer. A pegasus flew down and allowed her to climb onto its back, saving her life. The two of them became inseparable. Thrasios, the triton hero. Only a handful of tritons live among the humans of Meletis. 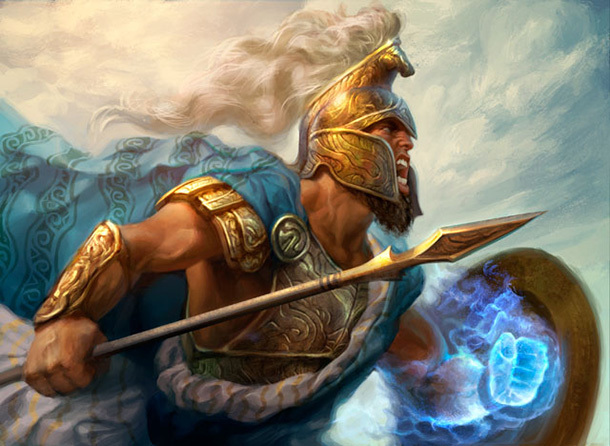 The most famous is Thrasios, an accomplished warrior who believes he bears the divine sanction of Thassa, god of the sea. 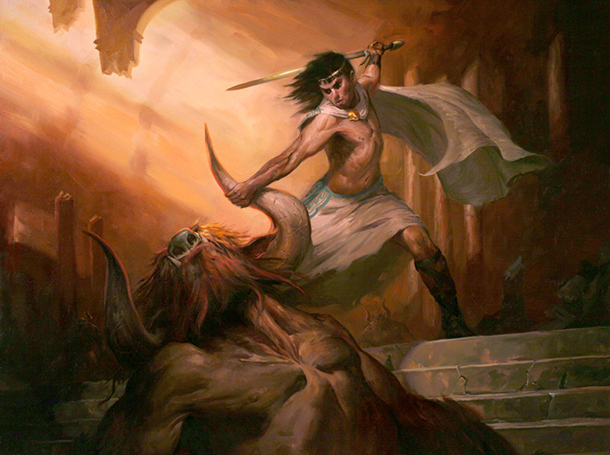 Meletians saved Thrasios's family from a pack of marauding minotaurs, so he now fights for the honor of Meletis. His prowess in battle is said to be miraculous; no blow ever seems to land on him. Agnomakhos, the Archon Tyrant. Meletians know that the area that is now their city-state was once ruled by an archon—a hooded warlord who rode a great flying beast—called Agnomakhos. 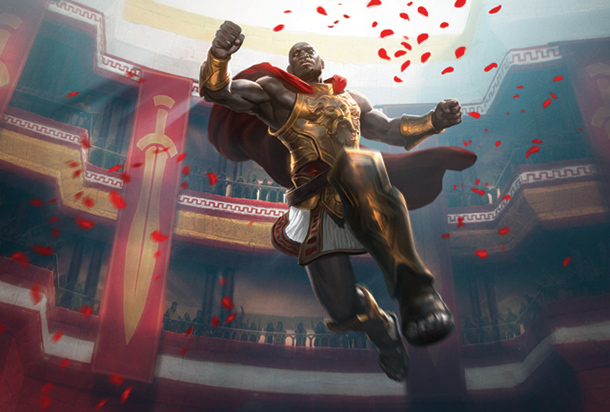 Agnomakhos ruled with an iron fist for centuries, apparently immortal, outliving the generations of leonin that he used as his soldiers and personal guard. Agnomakhos aggressively expanded his empire during his reign, spreading it as far as the forests to the north and the mountains to the east, imposing merciless order over the wilds wherever he went. The legend goes that the god Ephara granted magic to the humans to help them overthrow Agnomakhos, cast out the leonin, and free Meletis from tyranny. 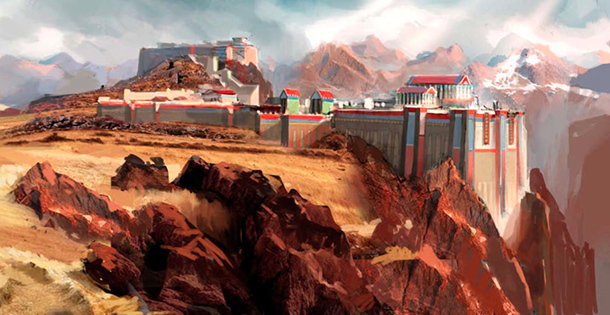 The humans who were victorious over Agnomakhos founded the enlightened polis of Meletis from the wreckage of Agnomakhos's empire. To this day, the leonin remain detached from Meletis and uninterested in trade or dialogue. 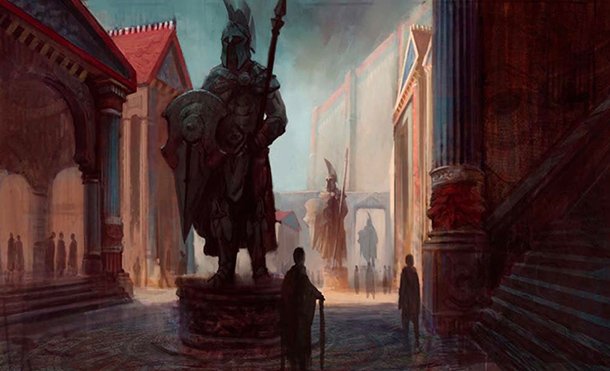 The mountain realms that surround the mighty polis of Akros serve as shield between its holdings and the rest of Theros. The Akroans are half-mythical even within their own time. 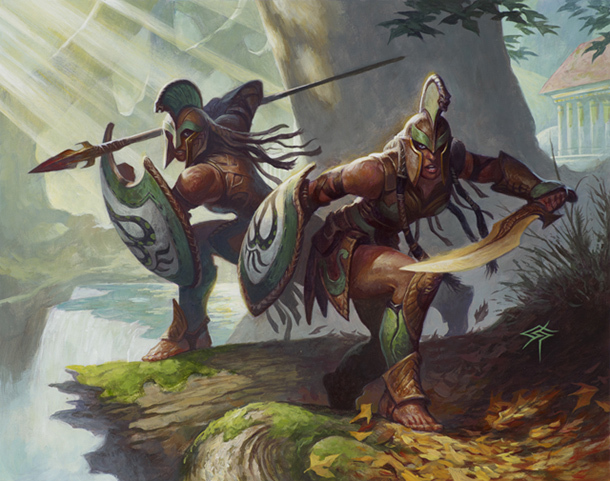 They are known to be the most feared warriors of Theros. They have lived and died by the spear in the name of countless kings, hardening their armies generation after generation by fostering a culture that revolves around perfecting the body and the mind for combat. The Kolophon. The central fortress and seat of Akroan power is the Kolophon, a huge, many-tiered structure perched on a cliff. Within its thick stone walls the Akroan people worship, train, and conduct their lives. At the innermost part of the Kolophon rests the hall of the Akroan king. Here, scouts and couriers give reports from outposts that stretch to the furthest reaches of the Akroan territories. Outposts. Scattered throughout Akros are several outposts—staging grounds for Stratians to venture out and seek plunder or patrol for monsters and invaders. One-Eyed Pass. This outpost has been carefully chosen by the Stratians for a particular reason: the abundance of cyclopes. They funnel their enemies into the pass, using the cyclopes who aggressively defend their territory as a gauntlet of certain death. Pharagax Bridge. The Stratians defend this huge stone bridge with all their might against any who would enter Akros without the king's permission. Some claim that the massive chasm it spans leads to the Underworld, and that foul creatures emerge from its depths. The Titan's Stairs. This is a natural access through the granite cliffs that protect Akros. Stratians have guarded this strange formation for centuries and have used it as a staging ground for invading the lowlands. Temples. There are a few temples in Akros dedicated to the major gods—mainly Purphoros and Iroas—but due to the Stratian duties of many Akroans, the major temples are located afield, in mountainous places. Phoberos. Phoberos is the badlands of the Akroan realm. It is the line of demarcation between relative safety and certain peril. Encampments of Stratians are always stationed here on the border between the human realm and those beyond. They're relieved every month or so by a fresh cadre of troops, who inevitably hear terrifying stories of marauding leonin, flesh-eating minotaurs, and firebreathing dragons. The borderland between Phoberos and Akros is long and rugged, and the Stratians are kept in wandering groups, patrolling the whole of the Akroan frontier. Stratians. 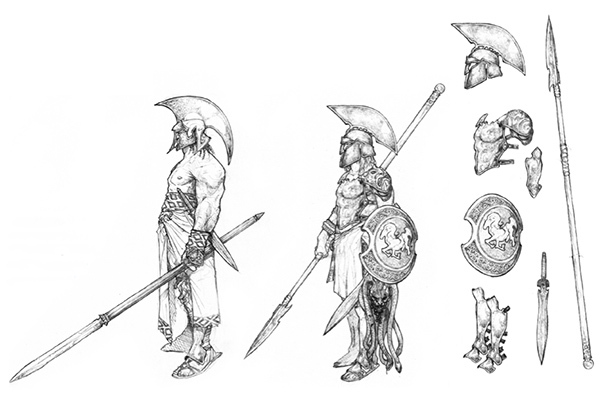 Although the center of Akroan culture is located within the great walls of the Kolophon, the main body of the population consists of wandering bands of warriors that make up the Akroan army: the Stratians. These warrior bands are entirely self sufficient, relying on hunting and plunder to feed their numbers and to train the young soldiers in the field. The Stratians are tasked with scouring the countryside for monsters that have strayed from their domains seeking to attack merchants and traders who travel the roads between poleis. Alamon (wanderers). These are the forces that are always on the move about the borders of the kingdom of Akros. They are tough and rugged warriors armed for speed, so they can move and strike without warning. They are the forces who find new domains for conquering. Lukos (wolves). These are the elite of the Akroan forces called in after the Alamon have spotted a target and have begun attacking it in their guerrilla style of assault. The Lukos march in and take over the village, capturing slaves to haul plunder back to the Kolophon. Oromai (watchers). These are the forces that never stray far from the Kolophon, protecting the fortress from invaders. The Oromai also keep the large population of serfs in check while the main part of the Akroan army is away for long periods of time. Anax and Cymede. The current king of Akros is a fierce warrior named Anax. 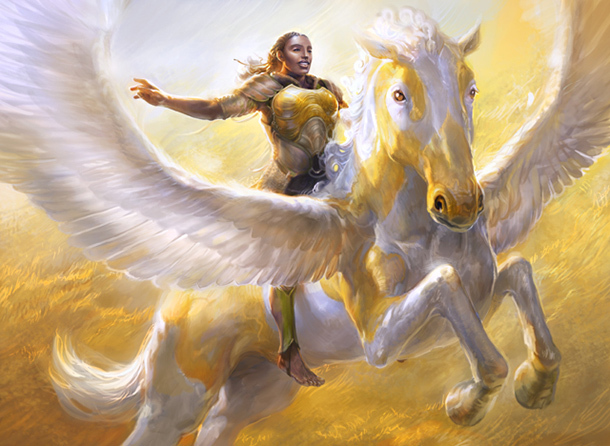 The current—equally fierce—queen is Cymede. Anax is a burly man in his late 40s, once a follower of Iroas. In his later years he has turned to Purphoros as he steers his people through the creation of a small empire. This shift is reflected in the trend in art now seen from Akroan artisans. Swords and armor are now decorated. Pottery, clothing, wall paintings, and weaving show ancient Akroan patterns and symbolism handed down for generations. To his people, Anax is a great leader to be followed without question. To other poleis, he is known as a skilled tactician and heartless killer. Cymede worships Keranos primarily. She is a skilled warrior but a more powerful seer. Having herself been struck by lightning and given a glimpse of the future, Cymede is seen by some as being partly responsible for her husband's effectiveness as king. Cymede is beginning to become aware of the power of godly creatures such as nymphs. She has seen abstract glimpses of their power and feels the gods are bestowing gifts on the faithful. Because of this, the cult of Keranos is gaining a foothold in the Kolophon. Cymede has even had a special temple built on a distant mountain summit where the storms are particularly severe. During the storm season, she visits there, meditating on a silver platform. Flamespeakers. These shamans of Purphoros worship strange eidolons said to inhabit the volcanoes and cracks in the great mountains of Akros. The Flamespeakers still have the ear and belief of many modern Akroans, and some make the pilgrimage far up into the mountains to be blessed by Flamespeakers or to receive prophecy from them. Androphages. During training, every Stratian is warned about the threat of Mogis, because it is during battle when the god can slip into the hearts of warriors, making them crave ever more blood and pain. 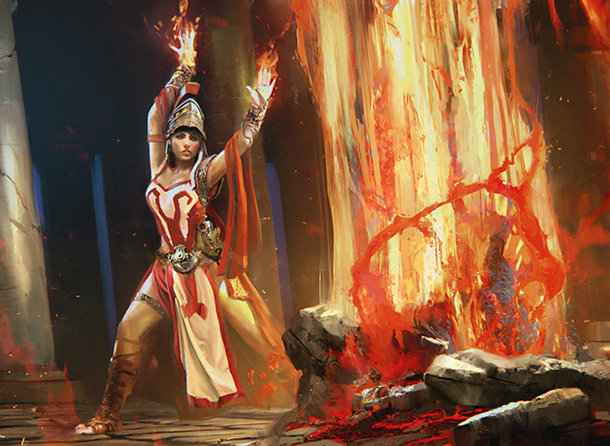 All Akroans know how Mogis can take a small flame of revenge and grow it into an inferno of madness. Those who are overcome by such desires flee the polis to find enclaves of those who worship Mogis. Not all who worship the twisted god are cannibals, but all crave rage and bloodlust—and some do crave human flesh as the minotaurs do. 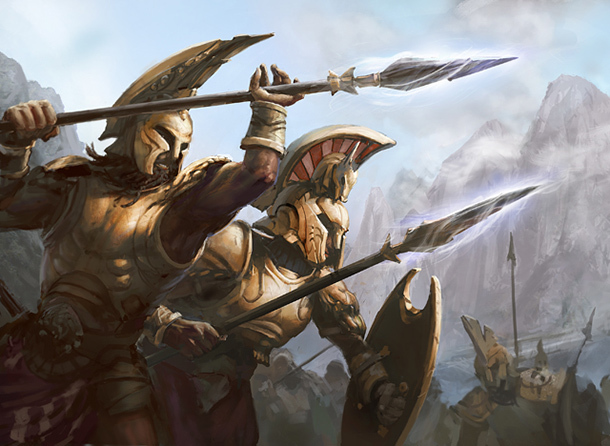 Because of their warrior culture and discipline, the god Iroas favors the Akroans. The Iroan games are held every year in the withering heat of the summer to weed out pretenders and to allow only the most hardy of athletes to prevail. The central podium where athletes receive awards is also the main temple of Iroas. Lanathos. The Akroan wrestler Lanathos, after defeating all combatants in the arena, took on a wild Akroan bull for a true challenge, pinning the beast after a day-long struggle. Nymosyne. 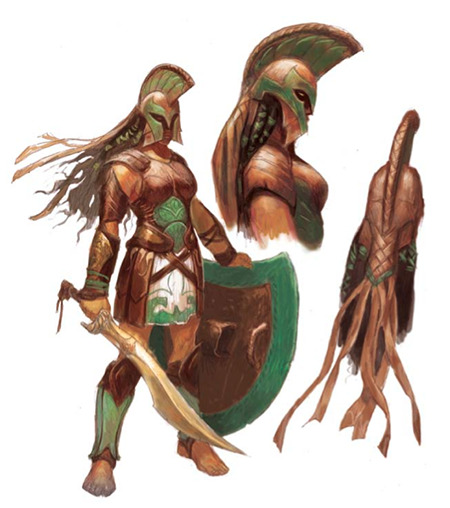 A warrior from Setessa, Nymosyne was renowned for her prowess at pankration (a hybrid of boxing and wrestling). 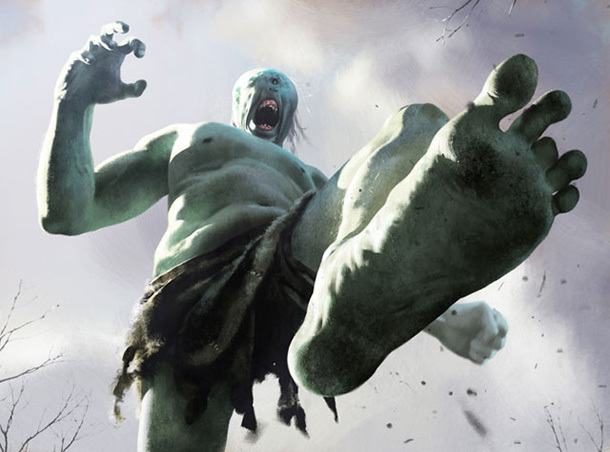 Legend has it that in the middle of a match, a cyclops raided the grounds of the games, attacking spectators and combatants. Nymosyne jumped out of the arena and, after a brief clash, snapped the monster's neck. From a bird's-eye view, Setessa's layout resembles the rings of a tree, which radiate outward from the Temple of Karametra at its heart. Swaths of forest alternate with family dwellings and other civic structures. Setessa encompasses a sprawling area on the border between the Nistos Forest and the open chaparral. Roads are winding and narrow and usually not wide enough to accommodate a cart. Rope bridges provide easy foot travel through the wild spaces. To the south, Setessa is bordered by a high ridge whose inhabitants have carved it into "shelves" for terrace farming and orchards, as well as digging warren-like dwellings inside the ridge itself. These defensible locations are used for protection when the city is attacked. Secret tunnels lead out into the forest. Setessa's outermost ring is a dense circle of trees and vegetation that functions as a natural wall against outsiders. The trees have platforms for archers and the wall is constantly guarded. Karametra's warrior-priests monitor who enters and exits the city. Although the people of Setessa value community and treat each other as family, outsiders are not readily welcomed. Setessa is populated mainly by women and children. There is no marriage and property is held communally. Ancestors are traced matrilineally. For the inhabitants of Setessa, the welfare of children is paramount. Karametra, the polis's patron, is the god of orphans, and abandoned children are brought from outside to be raised by the polis. The children of Setessa are called arkulli ("little bears"—singular arkullos), and are held in the highest esteem by the entire community. Children are welcomed everywhere, from the temple to the training grounds. There are men in Setessa, but most live near the Amatrophon, a menagerie at the edge of the polis. At a young age, men are encouraged to "peregrinate," a practice of wandering the world and seeking a home beyond that of their mothers. It is believed that women become heroes through martial training, while men become heroes by finding their own way in the world. Setessa has a nexus honoring each of Nylea's seasons and the accompanying Karametran planting rituals. There are no temples to other gods in Setessa, but offerings to any god may be placed at these holy sites. Under each nexus is a starfield—a vision of Nyx. As conduits to the various gods, the nexuses are a source of enchantment magic in this region. This phenomenon is called the Kelema Veil. In Setessa, oracles can decipher the Kelema Veil. It has been described as a misty starfield that flows across the land. Inside the starfield are images that resemble constellations. These tell stories of the gods and can be used to predict the future. Spring Nexus. The Spring Nexus is in a lush garden behind Karametra's temple. Its form is that of an arch made of vines and flowers that never fade. The Spring Nexus is the source of the magic of abundance, summoning, and healing. Although they have a tumultuous relationship, Karametra speaks of Nylea as her sister, and encourages people to leave offerings for her here. Summer Nexus. The Summer Nexus is in an ancient olive grove near the Bassara Tower. Dark green leaves form a canopy over the grove, and it is a favorite resting spot for the many animals who wander freely through the polis. Summer is seen a time of strength, and the Summer Nexus is a source of increased power. Nylea is worshipped here, as is Iroas before the Iroan Games. Autumn Nexus. The Autumn Nexus is in a golden-apple orchard along the Southern Ridge. A natural basalt arch leads into a narrow cave where a fire is kept burning at all times. The people of Setessa believe that it is Purphoros's fire that warms the earth enough for the autumn harvest, so people give offerings in hopes of an autumn bounty. The Setessan warriors pay homage here to the Twins of War, Iroas and Mogis; they see honor and fear as equal parts in victory. Winter Nexus. Winter is seen as a time of sleep and death. The Winter Nexus is at the far edge of Setessa in an old lion's den believed to predate the founding of Setessa. The ancient den is in a small rocky cave below a burial mound. The cave is said to lead down to the Underworld itself, and the smell of blood and decay hangs in the air. Here, people make offerings to Pharika and to Erebos in hopes of sparing themselves grief or pain in old age, or in remembrance of someone who now walks in the Underworld. There are four watchtowers in Setessa. Each is named for an animal, and each has a regiment of Setessan warriors attached to it. Leina Tower (lion). 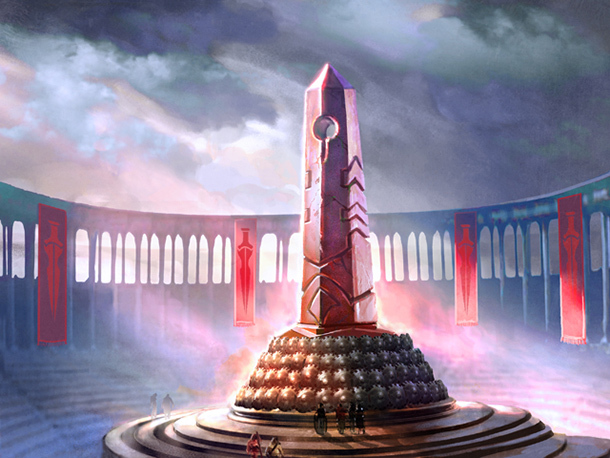 This limestone tower stands near the Temple to Karametra at the heart of Setessa and houses the polis's protectors. 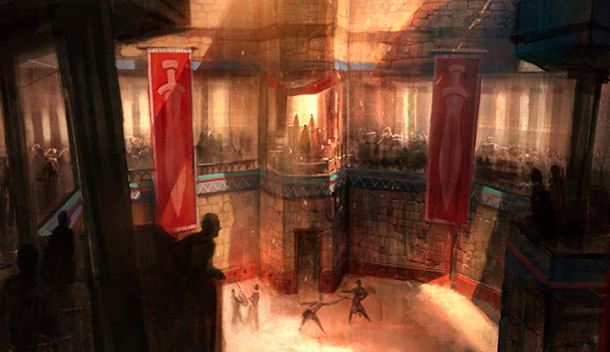 They fight with double-edged axes and provide most of the martial training for the arkulli. Their leader is Anthousa, who also leads Karametra's Council of Warriors. She is considered the god's closest advisor and de facto ruler of the city when the god is not present, which is much of the time. Hyrax Tower (falcon). This wooden tower stands on the ridge along Setessa's southern border. It is occupied by falconers and scouts. Their leader is Phaedra, a former orphan from Meletis raised in Setessa. She is only nineteen years old, but her skills in battle earned her a place of leadership. Bassara Tower (fox). The regiment stationed in this tower protects the Nistos Forest and watches for interlopers who enter without Nylea's permission. Bassara warriors are welcomed by Nylea and spend extended periods of time living among the ancient trees. During their training, they focus on archery and guerrilla warfare. 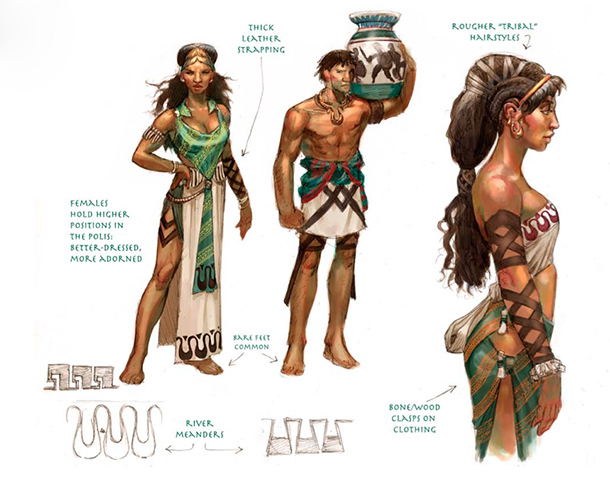 Their leader is Niketa, a woman in her fifties who now spends most of her time in Setessa. She supervises archery training for the arkulli. Ophis Tower (serpent). This tower is hidden in a wild space near the temple to Karametra. It serves as a base for wandering warriors and spies who travel incognito to gather information for the Council of Warriors. They search out routes for "peregrinations," including sympathetic households who will mentor young men at the beginning of their journeys. Ophis warriors also seek lost and abandoned children and bring them back to Setessa. Their leader is Kallias, who was sold into slavery as a child. She lost an eye and several fingers before she was rescued by the Ophis and brought to Setessa. Abora Market. The Abora Market is a giant, open-air market just inside the main gate of Setessa. Outsiders are allowed to use the market on certain days but are prohibited from roaming the polis at large. 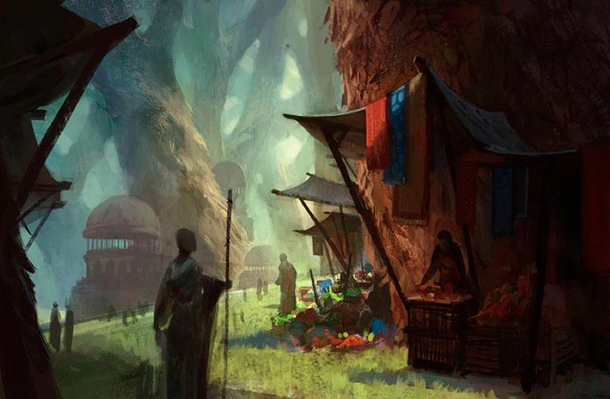 For Setessans, the market is open every day, year round. Currency is not common, although foreign sellers sometimes accept coin. For Setessans, all commerce is done in trade. Fresh fruit, vegetables, baked goods, fish, meat, nuts, seeds, and spices are all plentiful. There is a permanent "raptor hall," where falcons and other trained raptors are sold to merchants from other cities. 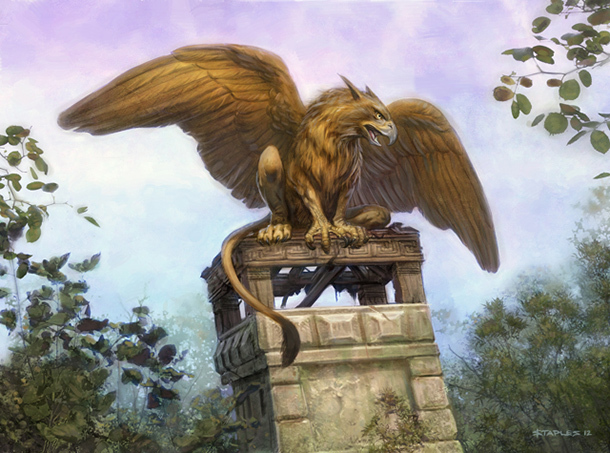 Trained Setessan raptors are considered the best in Theros. Amatrophon. The Amatrophon is a safe haven and training ground for a diverse range of animals. These creatures occupy an honored place in society. The Amatrophon encompasses a large region of forest and grassland at the edge of Setessa. There are extensive stables for horses and combat training grounds for warriors and animals alike. Karametra values animals as natural protectors. Pegasuses, wolves, and even lions are all trained to accompany warriors in combat. They also wander freely through the polis, serving as free-ranging guards. Men who remain in Setessa take care of the animals and help train horses, falcons, and other animals. Anthousa and the Colossus. 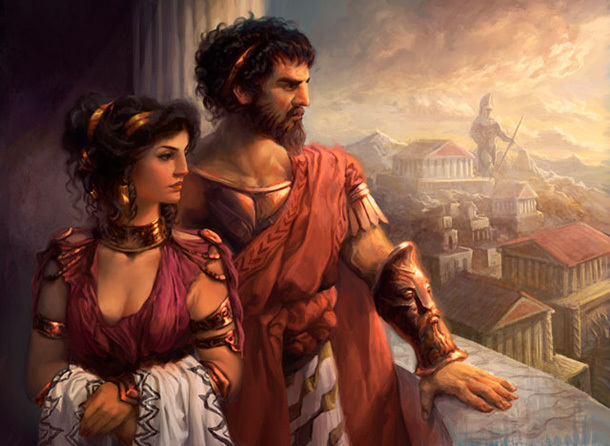 After a storm shook Setessa, taking down centuries-old trees, Karametra chastised Keranos for his selfishness. Furious at her impudence, Keranos sent a storm of truly epic proportions to destroy the crops, snap the branches from the young trees, and force the people to huddle indoors. Young Anthousa had been hunting and was caught in the deluge. Knowing she was Karametra's favorite, Keranos sent a bolt of lightning down from Nyx. It struck the grave of a titan, buried for countless centuries under the earth. The ground rose before Anthousa, uprooting trees as frightened birds fled into the stormy sky. An earth-titan, easily thirty feet tall, rose from his primordial resting place. Grabbing the trunk of a broken tree, he swung wildly at the young warrior. Anthousa narrowly escaped, and the titan gave chase. Nylea saw the scars on the face of her forest and raised vines to clutch at the titan's legs. Turning back, Anthousa saw the titan stumble. Quick as a deer, she used the vines to scale up to his shoulder as he struggled to get free. Anthousa sought the soft flesh just below the titan's ear. Calling out to Karametra, she drove her dagger deep into the flesh. 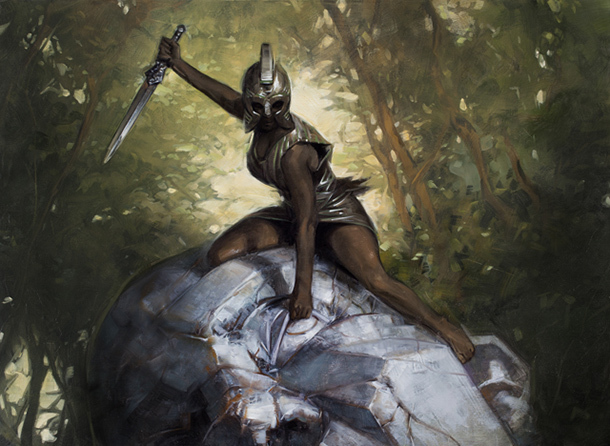 Hearing her daughter's plea, Karametra enchanted Anthousa, giving her the preternatural strength needed to cleave the titan's head from his body. The severed head fell to the ground, where it sunk halfway into storm-soaked earth. There the skull lies to this day, the home of foxes that shelter in the great cave of his mouth. 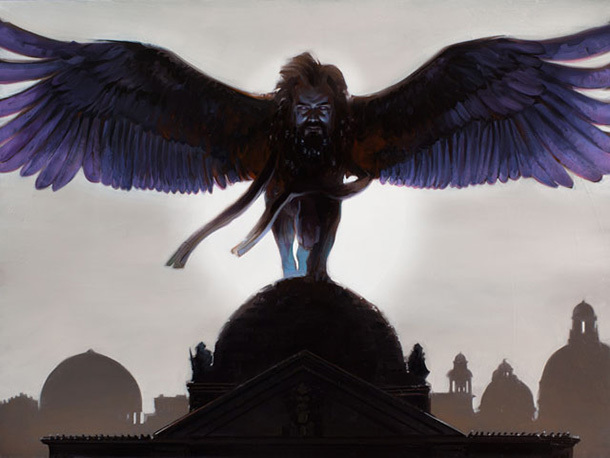 In Part 3, we will take a look at the monsters and non-humans of Theros.